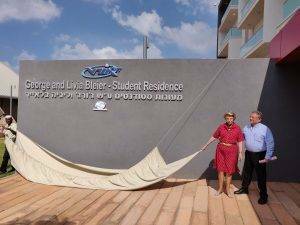 Right after the Rosh HaShana holiday, a new dormitory building was inaugurated at the Sci-Tech Hermelin College in Netanya. 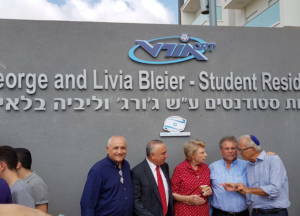 The building is named after George and Livia Bleier. The dormitory building, designed by architects Haim and Dana Kehat, is planned as part of the college’s wider campus. The four-storey building contains 27 spacious apartments comprised of three personal bedrooms each, as well as five accessible apartments. It is a Green Building, compatible with the strictest standard in this field. All apartments come fully equipped with the necessary furniture and electrical devices. The apartments in the second-to-fourth floors also have balconies. Furthermore, each floor has a common lounge for the floor’s residents, enabling them to socialize and study together. The dorms are managed by Mr. Pavel Goscinsky, who has a long managerial record in the fields of informal education and boarding schools. 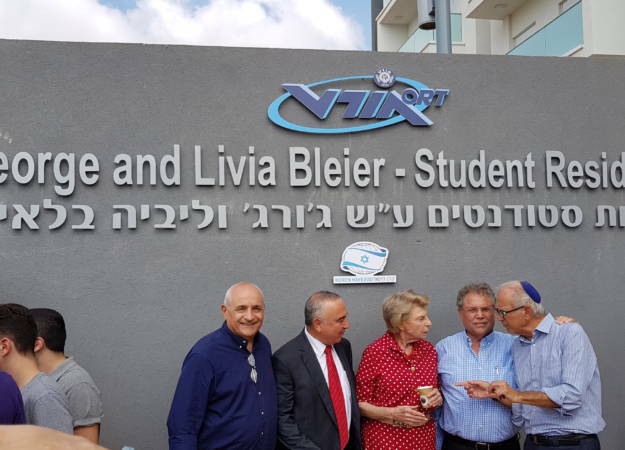 Sci-Tech Hermelin College held a celebratory and heartfelt ceremony for the inauguration of the new dormitory building, honored by the presence of Mrs. Livia Bleier who came all the way from Brazil. 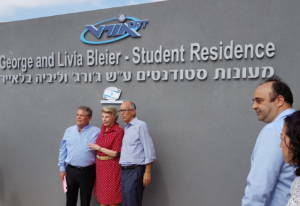 After the ceremonial unveiling, a Mezuzah was installed by Mr. Zvi Peleg, Director General of Israel Sci-Tech Network. An honorary reception for Mrs. Bleier was then held in the college’s auditorium. The ceremonial event was honored by the presence of Netanya’s Deputy Mayor, Mr. Eli Dalal; Netanya City Director General, Mr. Paul Vital; Representative of Sci-Tech Israel Board of Directors, Adv Yehoshua Neman; Sci-Tech Network’s Director General, Mr. Zvi Peleg; Sci-Tech Network’s Deputy Director-General and Head of Sci Tech’s College Network, Dr. Shmaryahu Rozner; the network’s Deputy Director-General and Head of Acquisition, Properties and IT Systems, Mr. Rami Kora; and the Director General of Keren Hayesod, Mr. Greg Masel. 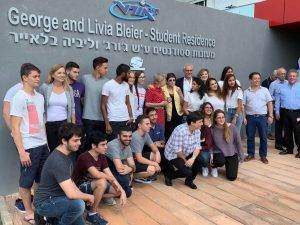 Participants in the ceremony also included the college’s students and lecturers, Sci-Tech Network’s senior management, representatives from Keren Hayesod, family members of the donor, and others. About 80% of the students residing in the dorms are studying in pre-military technological programmes, taking part in prestigious, unique projects which the college is leading in partnership with IDF corps such as: SigIT & Omega, Intelligence Corps (8200 Unit), “Marom Yael” programme with the Teleprocessing Corps, and the “Bareket” programme with the Technology and Maintenance Corps. Additionally, the dorms accommodate students taking courses associated with MAHAT (The Government Institute for Technology and Science Training) – notably the new “Atidaim” programme launched in the college at the same week, for Industrial Engineering students majoring in Tourism and Travel Management, in collaboration with the Atidim Foundation and Dan Hotels. Furthermore, during this academic year the college will launch, together with the LEAD Foundation, a programme called Momentum aiming to develop leadership and social engagement, which is also offered to the students residing in the dorms, in order to encourage them to take on social involvement in addition to their technological studies.